I was brought up eating milk puddings of all shapes and sizes with everything from semolina, tapioca, rice puddings and blancmange – which this desert most closely resembles. A favourite in my childhood, for my birthday, was a blancmange rabbit, with currants for eyes and sitting on a ‘grass’ bed of green jelly. 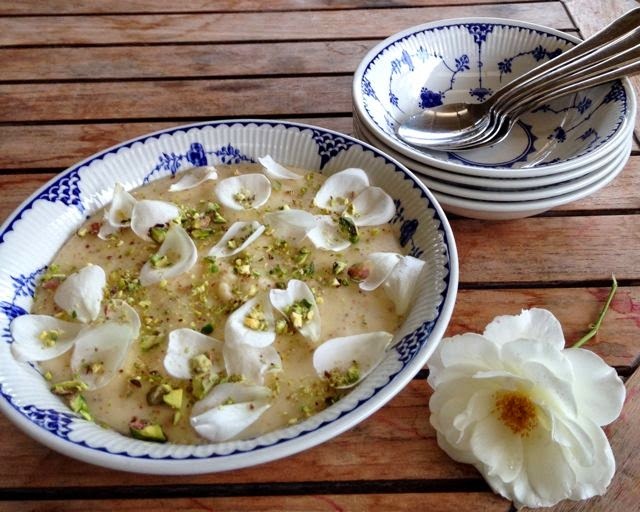 Milk puddings are also most common in the Middle Eastern, Greek and Indian cuisines – with simple ingredients that serve as comfort food or end up being quite regal – like this dessert MAHALLABIA which you will find all over the Middle East which is often served topped with elaborate chopped nut patterns. I like the simplicity of this dish, the yummy texture (I know it’s not everyone’s thing!) and delicate flavour. I think I have made a few converts as there is never any left when I make it! It’s something I do make frequently as it’s loved by children and grown-ups alike, and often serves as a light end to a spicy or heavy meal that doesn’t really need anything with it, but it does go really well with stewed berries or poached orange slices – depending on what you flavour it with. 1. In a saucepan mix the cornflour to a smooth paste with a little milk. 2. Whisk in the rest of the cold milk and sugar. 3. Heat gently, stirring constantly, until milk thickens. Cook gently for a further 2 minutes otherwise it will still taste ‘floury’. 4. Add rose OR orange blossom water and ground almonds and whisk through. 5. Pour into individual serving bowls (or glasses) or one large bowl. 6. Chill for an hour or so. NOTE: If I have flavoured it with rose water I like to serve it with berries – with orange blossom water I like to serve with poached and chilled orange slices. ANOTHER VERSION is with cardamom (and if you don’t have orange blossom or rose water!). You just have to take a slightly different approach. 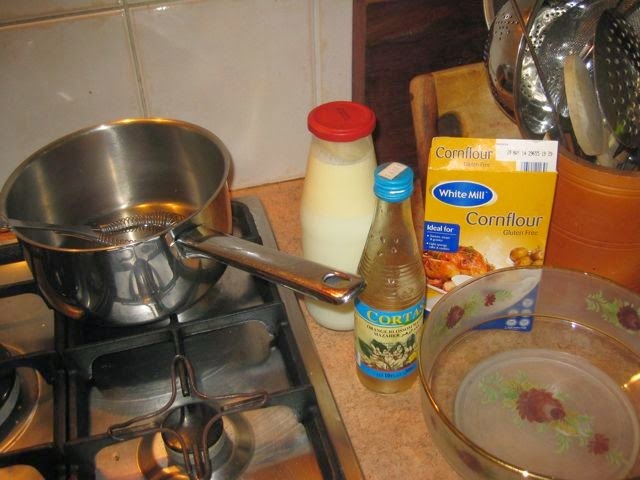 Mix your cornflour to a paste with some of the milk. In another saucepan heat the milk through with 6 bruised cardamom pods. It doesn’t matter if some of the seeds go into the milk. 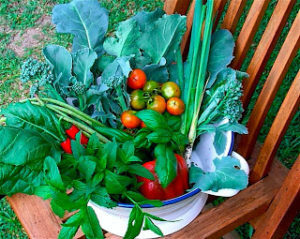 Turn off the heat and let it sit for about ten minutes to let the flavour infuse. Remove cardamom pods from milk and whisk into cornflour paste. Proceed as for main recipe.